Since the charter of the club in 1943, members of the Rotary Club of Newcastle have dedicated time and effort to fundraising and volunteer activities in support of community projects and international endeavours – this past year was no exception! To highlight just a few, we have made donations to our local 315 Newcastle Cadets, provided curling stones to the Miramichi Curling Club for their “Little Rocks” program, provided some new football helmets to the Miramichi Minor Football Association, donated to the 2018 Acadian Games that was held here in Miramichi, and helped to purchase trees for the Natoaganeg Community Food Centre for their fruit orchard. We have donated to Sistema Miramichi, whose mission is to inspire children and youth to achieve their full potential through learning and performing orchestral music, raised funds and awarded scholarships and bursaries to local high school students and raised awareness of polio by collecting funds to eradicate the virus worldwide. We supported the Rwanda 2020 trip for Anglophone North School District, sent one student to Ottawa for Adventures in Citizenship, and one student to Belgium for a youth exchange (welcoming another from Spain). Our biggest donations this year were in support of building the King Street School soccer field house and the purchase of a Gamma Lymphatic Probe, in support of the Miramichi Regional Hospital Foundation. We are pleased with these projects and the wide effect each will have on our community. We do all this through various fund-raisers, including the Purse Auction and Rotary RibFest, but also the Scott Knowles Hockey Pool, Purple Pinkies, Pizza for Polio, and an online Facebook auction. Our members participated in the Chambers of Commerce curling bonspiel, Team Up to Clean Up, and the sale of 75 maple trees to beautify our community. Meetings saw a wide variety of interesting speakers bringing us information about their events, causes, and community happenings. Thank you to all the Rotarians, Friends of Rotary and most importantly to the Miramichi community and local businesses. Without the generosity of our amazing community of sponsors and donors our goals would never be met. Did we mention the club also turned 75 years old in 2018! 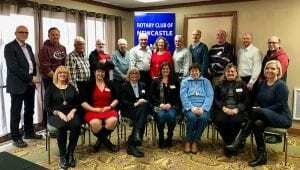 Our Rotary members are in full swing planning this year’s 2019 Newcastle Rotary Ribfest which will be held the weekend of May 24 – May 26, 2019! If you are interested in volunteering, entertaining, becoming a vendor or becoming a sponsor please email us at newcastlerotary@gmail.com. Also we are excited to begin planning our 2019 Newcastle Rotary Purse Auction that will be held in late October. So keep checking our Newcastle Rotary Facebook page for updates. Finally, we ask you to please invite friends and family to like our Facebook page, www.facebook.com/newcastlerotary. Service clubs depend on the support driven by getting information out to the public, and ours is no exception. Thank you for your support.